The Florida Fish and Wildlife Conservation Commissioners (FWC) on June 22nd rejected the recommendation by FWC staff to hold a modified hunt this year and approved Option 3 of four considered, postponing the black bear hunt until 2017. Click here & scroll to page 8 for all 4 options considered. It was good news for Florida black bears, and a major victory for environmental and animal rights activists. Sierra Club members joined thousands of Floridians who protested, made calls, and sent comments opposing the hunt. The vote was 4-3. Voting in favor of postponing the hunt until 2017 were Ronald M. Bergeron, Brian Yablonski, Bo Rivard, and Robert A. Spottswood. Voting for a hunt this year were Aliese P. "Liesa" Priddy, Richard Hanas, and Charles W. Roberts III. Information about the Commissioners and how to contact them can be found at this link. The FWC made it clear that it was delaying, not ending, its bear hunt in a news release following the vote. "Although the framework for bear hunting in Florida remains in place, there will be a zero hunt objective set for 2016 and the Commission could consider future bear hunting in 2017," said the FWC release. 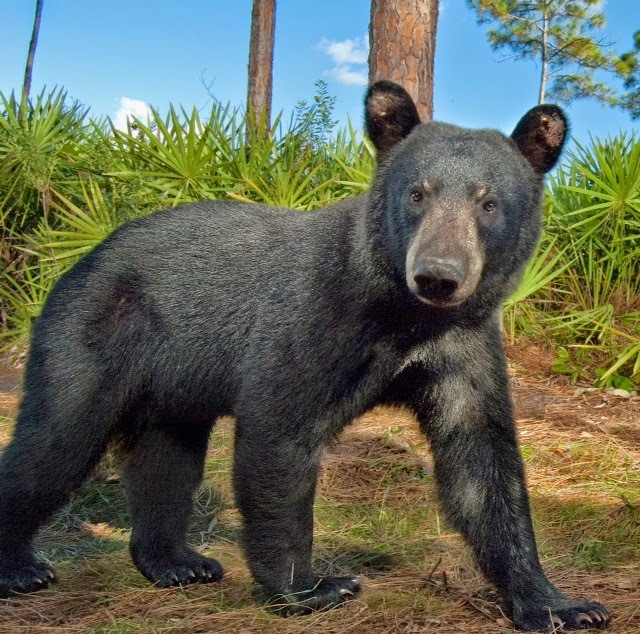 Sierra Club Florida, representing 31,000 members from Pensacola to Key West, vigorously opposes hunting of Florida black bears. Sierra Club Florida joins millions of Florida citizens who are against the hunt. We support the no hunt option being considered by the Florida Fish and Wildlife Conservation Commission. The survival of the Florida black bear is threatened by destruction and fragmentation of its habitat, hundreds of road collisions, and a diminished food supply. Hunting doesn’t just reduce bear numbers. When added to the other threats faced by bears, it increases the risk of the bears' extinction. In March, Sierra Club Florida joined the Center for Biological Diversity, several other organizations, and nationally-prominent conservation biologists in a petition to the US Fish and Wildlife Service to list the Florida black bear as an endangered species. Our call to the federal government is to protect the bear from extinction, and our call to the state government is to provide more habitat to facilitate the full recovery of the black bear. Last year we witnessed the heart-rending massacre of 304 Florida black bears over the course of just two days. FWC staff grossly miscalculated how easy it would be for hunters to find the bears and kill them. According to FWC’s own report, 59 percent of the bears killed statewide were females, while 21 percent of those were lactating females. We reject the false promises offered that the hunt will be carried out in a more humane and measured manner this year. We believe that the impetus for hunting in Florida comes from the development industry and its supporters in government, including Governor Rick Scott. It is no secret that the Governor and his developer friends want to build new roads and cities across the state. And it’s no accident that the majority of the members of the Florida Fish and Wildlife Conservation Commission appointed by Governor Scott have major employment or financial interests in the development industry. The Governor’s master plan would double the human population in Florida over the next few decades and move the new inhabitants to the rural and wild heartland of the state. It would open up existing black bear areas to intense development, leading to more road collisions and more conflicts with bears. It is the opposite of what needs to be done. What’s needed is to use documentary stamp dollars mandated by the voters in approving Amendment One to acquire the land needed to restore the black bear’s habitat. The only beneficiary to expanded development and destruction of the heart of wild Florida will be the greedy developers and the political leaders who feed off their trough. The rest of us will suffer a diminished quality of life and the tourist industry that serves as the backbone of Florida’s economy will decline as wild Florida disappears. Last year, the FWC staff stated that the goal of the hunt was to reduce the number of Florida Black Bears to sustain its population and it wasn’t intended to resolve conflicts between humans and bears. We find that argument disingenuous. The demand for hunting was stimulated by bear-human conflicts, not overpopulation of the bears. It’s conflict reduction that’s needed, not a reduction of the number of bears, and there are several ways to do that. The best approach is to use Florida Forever funds to purchase land needed to restore the black bear’s natural habitat and to stop encroaching on that habitat through continued urban development and sprawl in Florida’s heartland. We also need to require bear proof garbage containers in residential communities adjacent to black bear areas, and we need to make sure that the bear’s food source in its natural habitat is plentiful and not threatened by human encroachment. There are currently 4,000 black bears and 20 million people in the state of Florida. That’s 5,000 people for every black bear. Certainly we can find a way to protect this population of bears that is much, much smaller than our own. We can protect the bears and let them live in peace in their native homeland. Florida Sierra Club urges the FWC to adopt the no hunt option -- and to reject the other three options. PSTA moves forward to add its 1st zero emission electric buses to its fleet of diesel and diesel hybrid buses. Now it's up to YOU to take the next step: Fill out Pinellas County's survey on how to spend its BP $$. Details below. (St. Petersburg) As dozens of supporters of electric buses looked on, the Board of Directors of PSTA today voted by a 12-2 margin to acquire its first ever zero emission electric buses - IF the Pinellas County Commission votes to allocate funds to PSTA for an on route charging system. What you can do now to get electric buses in Pinellas: Go to the Pinellas County BP survey today and ask for funding for electric bus charging infrastructure. Note that it meets the County’s top priority for allocation of BP funds, transportation, and that it also qualifies under the criteria of an innovative pilot program. What better way to use these funds, provided to the county as recompense for the economic damage done by the 2010 BP oil disaster in the Gulf of Mexico, than to provide the essential basis for the county’s transit system that show the community and its millions of visitors, in a very visible way, that we are moving away from our vulnerability to the oil industry, by switching to transportation that will never need any oil? Please act today - the deadline for online comments is Thursday, June 30. The Pinellas Suncoast Transit Authority board also directed staff to immediately issue a Request for Proposal (RFP) for electric buses, and to include in the RFP the stipulation that applicants include an option for the lease of the battery (about 1/3 of the total cost of an electric bus). The RFP for electric buses came at the recommendation of members of the Tampa Bay Zero Emission Coalition, a Pinellas based group of 39 businesses, neighborhood associations, churches and non-profit organizations, which urged PSTA to start making the switch to electric buses in earnest by considering bus purchases in as thorough and serious a manner as it does the purchase of any type of equipment or service. PSTA CEO Brad Miller told the board that he would get busy working on the RFP “as soon as this meeting adjourns”. In voting to start making the switch to electric, the board rejected staff’s recommendation that they purchase its first diesel buses since adopting a policy on sustainability that has resulted in the agency exclusively buying the cleanest running buses previously available, diesel hybrids, for the past 8 years. The board soundly rejected the Finance and Performance Committee’s recommendation to buy three new diesel and 2 electric buses, preferring County Commissioner Ken Welch’s Planning Committee recommendation to the board to instead buy 3 diesel hybrid and 2 electric buses. The purpose of leasing the electric bus battery to is to shift about 1/3 of the capital expense of this type of bus from PSTA's limited capital funds to operating expenses, the area where electric buses save transit agencies hundreds of thousands of dollars over the life of a bus, due to their drastically reduced fuel and maintenance expense. The Tampa Bay Zero Emission Coalition recommended that PSTA buy 5 electric buses, as it is likely that the RFP with a battery lease option will clearly show that PSTA can, in fact, better afford electric buses than either diesel or diesel hybrid. The purchase of any electric buses is still contingent upon allocation of BP settlement funds by Pinellas County to PSTA for the express purpose of covering the cost of an on route quick charging system that would enable as many as nine electric buses to serve various routes in the same general area. Downtown St. Petersburg was identified by PSTA staff as the most feasible location to initiate zero emission electric bus service. Many on the board as well as citizens commented on the benefits to both riders and residents of the downtown area. Rebecca Falkenberry, owner of a townhouse in downtown St. Petersburg that PSTA diesel buses now drive past, told how she is now forced to spend $10,000 to soundproof her windows that she now must keep closed at all times to keep out noise and toxic diesel soot, issues that would both be completely eliminated by electric buses. PSTA’s vote means that, should the County Commission allocate funds for a one time purchase of electric charging infrastructure, PSTA will acquire its first two electric buses and put them in service by next year. Moreover, such an allocation would make it possible to acquire as many as seven additional electric buses that would all use the same charging system. The Pinellas County Commission is taking comments through June 30 via an online survey. Commissioner Ken Welch and other commissioners on the PSTA board encourage citizens to ask for funds for electric bus charging infrastructure, as it meets the County’s top priority, transportation, as well as meeting criteria for innovative pilot programs, using only about 9% of the County’s BP settlement funds. St. Petersburg citizen representative Ben Diamond questioned the procurement process that PSTA staff is following with regards to electric buses, with CEO Brad Miller revealing to the board for the first time that if the agency’s federal “Low/No” grant proposal to acquire funds for 5 electric buses fails (a likely outcome, considering the number of applicants nationally for extremely limited funds and the widespread desire to acquire electric buses) that it is his plan to develop a procurement process for electric buses. Miller stated he would do so “immediately following this meeting.” Having heard this explanation, and being assured that the RFP would include a request for the option to lease the electric bus battery, Commissioner Welch stated he would not amend his Planning Committee motion to include this stipulation, as this action would be taken immediately by staff. The Tampa Bay Zero Emissions Coalition led off two hours of public comment and discussion with the recommendation that PSTA issue an RFP for electric buses. While PSTA has had 4 electric bus manufacturers come by in the last year with their buses to show PSTA, it has never formally issued an RFP as is done as a matter of course with all procurements. The fact that PSTA staff made its case for acquiring its first new diesel buses in eight years solely on the basis of the premise that the agency could afford only diesel buses in order to not have to cut back on service, while failing to actually perform a routine, thorough review of all options available from electric bus manufacturers, makes one wonder how seriously PSTA staff has ever regarded the possibility of including electric buses in its fleet. Against the consensus expressed by the eighteen members of the public who spoke, as well as all 15 board members, that PSTA should move forward to electric buses, it is now clear to all that agency staff must now do what it has neglected to do for over a year: follow its standard business procurement practice, and end all negative, baseless speculation about what electric buses might cost, how well they might perform, etc. Over 50 supporters of electric buses packed the PSTA board room, many wearing red along with red stickers that read: “STOP Polluting Pinellas: Zero Emission Electric Buses Now!” Speakers included representatives of Chart 411, Environment Florida, Florida Food & Water Watch, Florida Consumer Action Network, The Electric Marina, as well as team members of the Sierra Club’s Florida Healthy Air Campaign. Greenpeace members wore red shirts that read “STOP Global Warming”. In addition to the coalition's letter to the board, the coalition presented petitions signed by 625 local residents. Despite fear by staff of their traditional tea party opponents, just one lone representative spoke against new, clean and quiet electric transportation technology. Sierra Club and its 38 allies in the Tampa Bay Zero Emission Coalition look forward to the day when modern, clean, quiet, oil and emission free transportation is available in Pinellas County. If you act now to complete the survey, that day can come next year. Do it today – the deadline for comments is just a week away: June 30. Tomorrow, June 22: Tell PSTA: Start the Switch Now to Clean, Quiet Zero Emission Electric Buses! PSTA (the Pinellas Suncoast Transit Authority) votes Wednesday June 22 on whether to buy new diesel buses or new zero emission electric buses. Sierra Club and the Tampa Bay Zero Emission Coalition support the addition of zero emission electric buses to PSTA’s fleet. Sign the community petition to PSTA to ask them to start making the switch this year to zero emission electric buses. Attend PSTA’s June 22 Board of Directors meeting and tell them face to face to make the switch to electric buses this year. Wear red to help tell PSTA to STOP Polluting Pinellas with toxic diesel emissions. The Board will vote on its 2016 bus purchase at its 9:00 am meeting. PSTA is at 3201 Scherer Drive, St. Petersburg, 33716 – behind the St. Petersburg Clearwater Marriott on Roosevelt. If you represent a business or community organization, join the Tampa Bay Zero Emission Coalition by signing our community letter to PSTA asking it to start making the switch now to zero emission electric buses. Email phil.compton@sierraclub.org for the letter. Thanks to the 39 local businesses, neighborhood associations and organizations who have joined the Coalition. Why make the switch to electric buses? They provide a totally different experience for riders: clean, quiet and safe. Passengers find they can carry on a conversation, and neighbors don't hear or smell them as they go by. No more toxic diesel soot! They help preserve Pinellas County's future as they cut net greenhouse gas emissions by 75%, even including today’s sources of electricity, coal and natural gas: 270,000 pounds of carbon/year compared to diesel or natural gas. Over the 12 year life of an electric bus, their overall net pollution will decline towards zero as utilities like Duke Energy add more solar power to their grid. any bus. As with any electric vehicle, there’s far less to maintain, so PSTA staff will be more certain they’re keeping all buses in the fleet running safely at all times. And they reduce the demand for oil that today drives oil companies to continue to push to drill for oil off Florida’s beaches, both the Gulf and the Atlantic. The surest way to end the push for offshore drilling is to reduce our demand for oil. Electric buses never use any oil, period. What is an electric bus? A bus that, rather than run on diesel or compressed natural gas, uses electricity to power a battery. This means no gasoline, no dirty oil changes, no internal combustion engine, no dirty diesel exhaust, and no greenhouse gas emissions. They charge up in anywhere between five and 360 minutes and go between 30 and 195 miles between charges, depending on the model. Transit systems in Los Angeles area, including Antelope Valley, Palm Springs. And the University of Montana in Missoula. As well as cities all over the world, including China, where 170,000 electric buses are fighting smog and climate change today. Thanks for asking PSTA to start making the switch now to clean, quiet, safe electric buses. New buses, either polluting diesels or pollution-free electrics, will be on our streets until the 2030s. Let's make the right choice for our future now! Sierra Club Florida News: Tell PSTA: Start the Switch to Clean, Quiet Zero Emission Electric Buses!